After the conclusion of Legion's expansion, I was hard-pressed to think of where Blizzard could go next. It's almost an instinctive reaction to go bigger with each iteration of a franchise, and you can't go much bigger than finally defeating the mad titan Sargeras – a figure in Warcraft lore that has been behind some of the most pivotal moments in the game. It would seem Blizzard were thinking the same thing when it came to "how do we top that?" because the team didn't go bigger: they went personal. With Battle for Azeroth, the story comes home to roost with an all-out faction war. 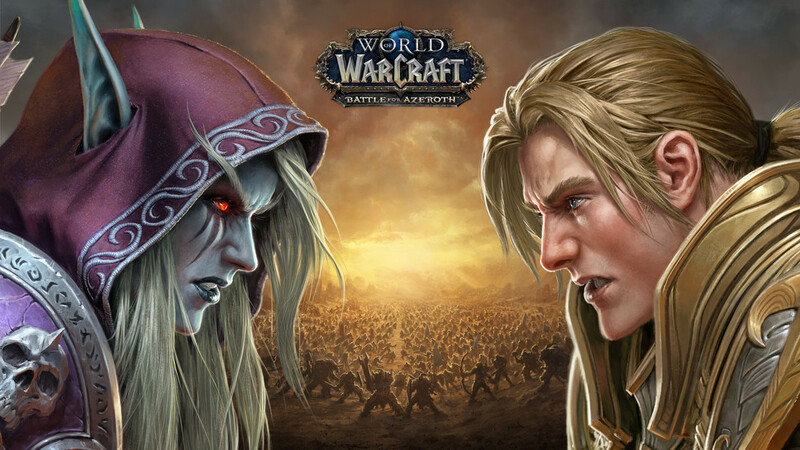 Fighting over a precious new resource and staving off the all-out destruction of Azeroth, this expansion offers a strong, grounded story line while still offering larger-than-life moments through its campaign, dungeons and raids, PvP battlegrounds and beyond. Legion may have seen Sargeras defeated and imprisoned, but his final struggle resulted in the massive titan plunging his sword deep into the world of Azeroth. This rupture caused a rich new mineral – aptly named Azerite – to erupt from fissures around the world, leading to an arms race and resource war between both Horde and Alliance factions. A truce that stood during Legion and saw many heroes (that's us) step across faction lines to take on the Burning Legion still lingers, but it is tepid at best. So when Warchief Sylvannas sets fire to the world tree Teldrassil, that truce is reduced to ashes along side the home of the Night Elves. Shortly after, the Alliance marches on The Undercity and quickly ousts the Forsaken from their home, awakening the conflict between the two forces that has existed since the original Warcraft RTS. As heroes of our respective faction, it's up to us to set out into uncharted waters, seek out new (and old) allies, and bolster the forces of either Horde or Alliance. Playing as a Draenei Hunter, I made my way to Kul'Tiras, and set about gaining the trust of the ruling House Proudmoore – the same family from which longtime hero, Jaina hails. As seems to always be the case, the region is amid strife as other Houses seek to take power from the Proudmoore family. At the same time, Jaina is imprisoned and set to face charges of treason for events that transpired back in the days of Warcraft 3. Fresh from fighting off the Legion, the Lightforged Draenei are lending their forces to The Alliance. As we set about restoring order and uncovering a plot against Jaina's mother, we adventure through the three zones of Stormsong Valley, Tiragarde Sound, and Drustvar. Questing in the first two zones are unfortunately forgettable. While the areas themselves feature gorgeous art design and atmosphere, I never found myself hooked into any of the storylines. In stark contrast, the questing in Drustvar is riveting from the moment you step foot off the boat. The ever-present mist and gothic woodland set pieces make for a brilliantly spooky setting. Coupled with the wicken enemies and villages beset with dark forces, the whole zone has you holding your breathe as you set about purging evil from each hub. An intriguing campaign of forming a inquisitorial force reminded me of the same quest progression I loved in Legion's Suramar zone – be sure to save this area for last. Something wicked this way comes in the spooky zone of Drustvar. In keeping with BfA's theme of "smaller is better", Blizzard implemented a stat squash in the lead up to the expansion's release. The most noticeable result was that attacks no longer hit for damage that counted into the sixth digit, which made for a much easier form of feedback. Critical hits are still as impressive, but now damage numbers have more meaning. This isn't the only way Blizzard have fine tuned the combat either. Classes have had small tweaks made that really forces players to be more engaged with their gameplay. This might be bad news for those casual players that like to button-spam until an enemy is dead, but for the most part, it results in moments that are truly rewarding, where tanks, healers, and damage dealers all have to work together to make their way through scenarios. Others have said it better than me, but it should still be stated that it's good to feel pride in my faction again. Both Legion and previous expansions have leaned into a "can't we all just get along?" mentality – which is fine for some narratives, but takes away from your character's identity. For many a character's race isn't just about its appearance in-game, but also the ideals and morality belonging to the culture – and the same can be said when it comes to choosing a faction. It's fantastic to see the community rebuff the actions of the Horde's leader with a #NotMyWarchief movement, and speaks to how well the narrative is speaking to its players. This renewed pride in Alliance and Horde has brought a new fervor to PvP as well. 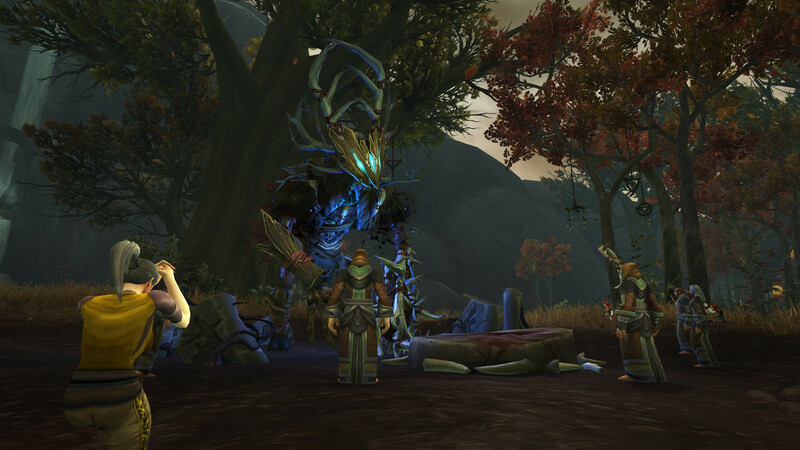 Helped greatly by the revamped Warmode system, there's countless moments of unexpected combat throughout the zones. 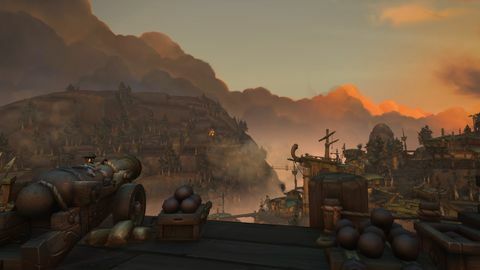 My first trip to Nazmir had me holding my breath as I skirted the coastline in a rickety boat, catching glimpses of combatant players running in parallel along the coastline. My time levelling saw countless moments of heroism as max-level players came together to thwart raiding parties that were set on ganking some helpless lowbies. A zone's chat was quickly utilised to give audibles on the location, class, and level of any invading parties, each time met with a stoic "I'm on my way" from some rescuer. PvP means something again, and as someone that's been a strong PvE-only player throughout my decade-long time in WoW, I'm having a blast. Looking beyond the new story and the emphasis on faction pride however, WoW's newly introduced features don't all stick the landing. The biggest stumble has to be the newly introduced Azerite system, replacing the Artifact Weapon system established in Legion. 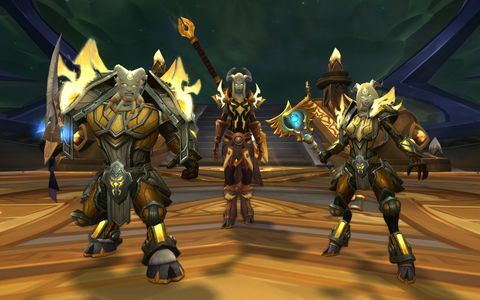 While Legion gave players incredible weapons that defined their character, had their own backstories, and unlocked new powers and abilities as they were infused with power, Battle for Azeroth's Azerite system is convoluted mess that results in a homogeneous experience where items are constantly replaced as players attain better gear for those slots. A lot of the frustration with this system comes from the endless grind attached to a unique necklace called the Heart of Azeroth. Each player is given one at the start of the expansion, and it is intrinsically linked to the unlocks of Azerite Armour for your chest, head, and shoulder slots. power for this necklace can be earned through a number of means – including quests, Island Expeditions, and grind-tastic World Quests. 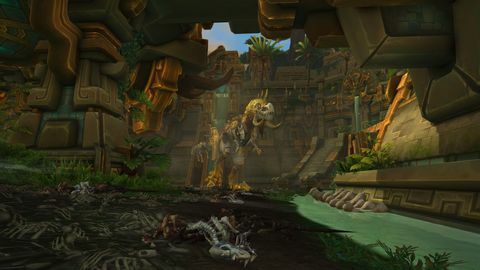 The island of Zandalar is home to many ancient creatures. There's a pirate's life to be had in Tiragarde Sound. Plenty of loot for those willing to claim it. Any player that enjoys their time in World of Warcraft is accustomed to some grind, and I'm not opposed it it myself – but there needs to be a light at the end of the tunnel for any sense of achievement. The grind attached to BfA's Azerite system seems to take two steps backwards for each step forward. The grind attached to BfA's Azerite system seems to take two steps backwards for each step forward. Instead of feeling like you're honing a powerful item, players are left with gear that might offer strong abilities and traits, but only if they unlock them all before the gear is replaced. The attention to detail that was given to custom appearances for a player's Legion Artifact Weapon has also been overlooked, with forgettable armour sets that almost encourage a player to transmogrify with a better aesthetic. Previously mentioned Island Expeditions are another disappointment in this expansion. The highly-championed game mode offers players randomly generated islands on which players would scramble for resources to claim for their faction. Along the way players encounter hostile NPCs, the occasional quest, and either an AI-based or player-controlled enemy force against which they are racing against. Island Expeditions on paper sound fantastic, but anyone that's heard the phrase "procedurally generated" knows how hard it becomes to ensure the zones a player encounters aren't bland and forgettable. To its credit, the enemy AI that Blizzard has crafted are fantastic, and result in some really fun emergent gameplay – especially when you crank the difficulty up to heroic or mythic levels, but nonetheless, the game mode quickly becomes another treadmill through which players can grind power for their Heart of Azeroth. In contrast to these complaints, the first raid for Battle for Azeroth is WoW at its finest. The difficulty curve is well designed, pacing is tight and fast-paced, and while the boss encounters require a high level of communication and coordination, your group won't be punished for a single player's downfall. Mechanics ensure that players are constantly engaged. Whether you're working through the space-limitations of Taloc or Mother's encounters, crowd-controlling enemies spawned by Zul, or playing hot-potato while taking down G'huun – there's always a way for you to contribute, and always a new goal to accomplish. 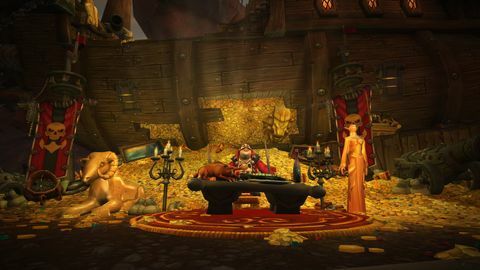 It's always hard to gauge the success or failure of a living game like World of Warcraft, when constant updates and content shift the focus of how the game is played. Whether the grievances of BfA remain is yet to be seen, but there's still plenty to keep players satisfied for the time being. Blizzard has already teased at new content that will continue the faction war narrative, while delving deeper into a narrative surrounding the Old God, N'Zoth – so it looks like there's still plenty of work going on behind closed doors. After 14 years, Blizzard still knows what's at the heart of WoW, while proving it's not afraid to try new things. While not every new feature is a home run, the expansion's tighter focus on "the war at home" reminds players about what made Warcraft so popular in the first place. Ups The Horde vs Alliance narrative is fantastic, and art design is breathtaking throughout. 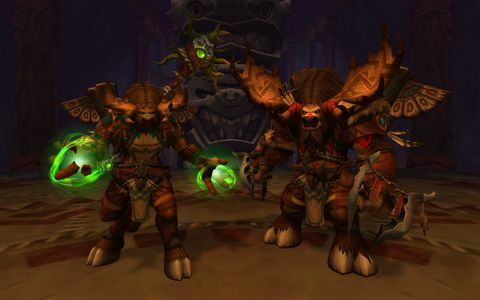 PvP Warmode brings danger back into exploration, while the Uldir raid is engaging and rewarding. Downs The Azerite system is convoluted and unsatisfying, World Quests quickly become repetitive and obsolete, and many zone narratives can be forgotten.